In 2004 Marilyn Norry sent a challenge to women actors in Vancouver, Canada: write the facts of your mother's life, just the facts, from beginning to end. 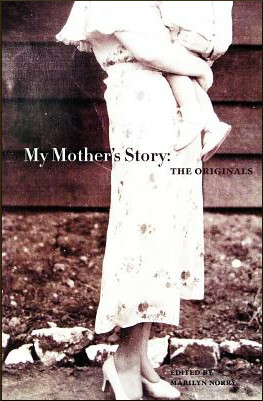 My Mother's Story: The Originals is an anthology of memoirs by 39 Vancouver actresses writing the story of their mothers' lives. These mothers come from around the world, with birth dates ranging from 1890 to 1954. Gathered together, these stories are a record of 20th century women's history, sketches of how women really lived. Written with disarming candour, these first hand accounts reveal the microhistory of women living through wars, poverty, prosperity, mental illness, addiction, artistic achievement, adoption, arranged marriage, infidelity, and the everyday trials and joys of women... everywhere. My Mother's Story: The Originals is the first book of the My Mother's Story series, part of a campaign that asks people around the world to record and share the story of their mothers' lives. The stories collected for the project have inspired and/or fuelled the development of an online Archive (www.mymothersstory.org), writing workshops, books, radio and film documentaries, a form of theatre and an entire social movement telling women's history... one mother at a time.